Common in nearly every medication, side effects are no stranger to blood pressure medications as every blood pressure medication has some kind of side effects. Which blood pressure medication that has the lowest side effects depends on how you react to specific medications and what side effects you find most bothersome. 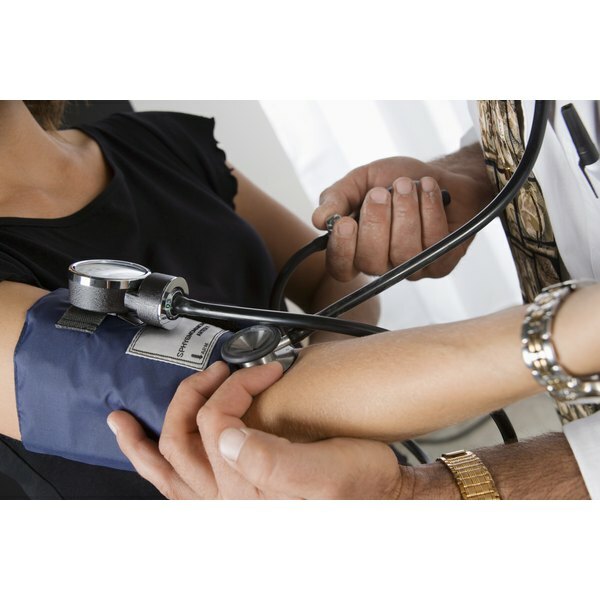 Most commonly prescribed blood pressure medications have an array of similar side effects. Depending on your health status, you may be able to take a diuretic, which does not have many of the side effects associated with beta blockers, ACE inhibitors, alpha blockers and calcium channel blockers. Diuretics have the lowest side effects of any blood pressure medication and thus are commonly the first course of medicinal attack to get high blood pressure under control. Diuretics are often paired with another prescription blood pressure medication to compliment to lower your blood pressure effectively. Although diuretics have the least side effects of blood pressure medications, they are not without side effects. If you take a diuretic, you may experience a decrease in your body's supply of potassium, weakness, leg cramps, problems with impotence and tiredness. Because diuretics increase the body's sugar level they are not advised for diabetics. If taken for a long period of time, gout is also a possible side effect. Most diuretics contain sulfa and should not be taken if you are allergic. Diuretics lower blood pressure by reducing the levels of sodium and water in the body, Thiazide diuretics are also the only diuretics that help to lower blood pressure by dilating the body's blood vessels. Some brand names of thiazide diuretics are Aquatensin, Diuto, Diuril and Diucardin. Losing potassium in the body can be one of the largest problems associated while taking diuretics. Potassium-sparing diuretics avoid this problem. Brand name potassium-sparing diuretics include Aldactone and Midamore. Loop-acting diuretics help to reduce the amount of water in the body by increasing urine flow to the kidneys, thus lowering the blood pressure. Loop-acting diuretics are known by the brand names of Edecrin, Uritol, Furoside and Lasix. Because diuretics are commonly prescribed with another medication to work effectively, you may not be able to rely solely on diuretics to control your blood pressure. Each individual reacts to specific medications differently, you and your physician may need to experiment with what medication works best for you. Beta blockers, ACE inhibitors, alpha blockers, and calcium channel blockers all have commonly experienced side effects. Beta blockers work by reducing the nerve signals to the heart and blood vessels, which, in turn, lowers your blood pressure. While beta blocker medication may work successfully with diuretics, beta blockers come with some side effects such as fatigue, cold hands and feet, depression, slow heartbeat and asthma symptoms. Beta blockers may also cause a person to have problems sleeping, and to experience impotence. Some common band name beta blockers are Acebutolol, Metroprolol and Atenolol. Angiotensin converting enzyme inhibitors, commonly known as ACE inhibitors, expand blood vessels and decrease resistance, which allows the heart to work more efficiently. Although ACE inhibitors help the heart pump blood more easily through the body, some side effects of these drugs, which include brand names Captopril, Vampril and Zestril, can be troublesome. ACE inhibitors may cause a skin rash, loss of taste and a chronic dry hacking cough. In rare instances and with long-term usage, ACE medication may cause kidney damage. Alpha-adrenergic antagonists, known as alpha blockers, relax your muscles and keep small blood vessels open. Specifically, alpha blockers work by keeping the hormone noreprine from tightening the muscles in the walls of smaller arteries and veins.The alpha blockers improve the blood flow in the heart and the body and, with the help of your diuretic, lowers your blood pressure. However, long-term use of alpha blockers may cause heart failure.Talk to your doctor for any concerns you may have concerning your alpha blocker medication. General side effects of taking alpha blockers may include pounding heart, a headache, nausea, weakness and gaining weight. Alpha blockers may also decrease or increase the effectiveness of other medications. Examples of alpha blockers are Doxazosin, Alfuzosin and Terazosin. Preventing calcium from going into the heart and blood vessels, calcium channel blockers can be utilized with the aid of diuretics to lower your blood pressure. Calcium channel blockers can cause some side effects such as heart palpitations, swollen ankles, constipation, headaches and dizziness.Two examples of brand name calcium channel blockers are Norvasc and Cardizem.